constrained testing often misses emerging or unexpected compounds. Recent improvements in chromatographic separation, detection, and processing allow for evaluation of these samples using nontargeted techniques. 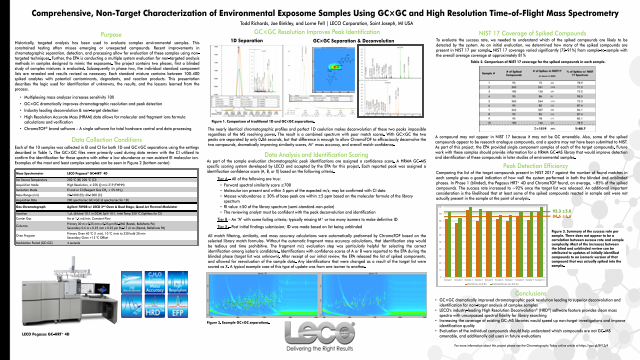 Further, the EPA is conducting a multiple system evaluation for non-targeted analysis methods in samples designed to mimic the exposome. The project contains two phases, first a blinded study of complex mixtures is evaluated. Subsequently in phase two, the individual standard component lists are revealed and results revised as necessary. Each standard mixture contains between 100-400 spiked analytes with potential contaminants, degradants, and reaction products. This presentation describes the logic used for identification of unknowns, the results, and the lessons learned from the process.